John Hershey’s mother died giving birth to him in 1916. His father, who was a farmer in Ohio, was left with four small sons. Unable to care for his new infant, Hershey's father sent him to live with distant relatives, who were not well off financially and who moved often. In his senior year of high school, he was sent to live with the headmaster at a private school. In exchange for doing chores around the headmaster’s home, Hershey was able to attend the school. In this new stimulating environment, his grades, which had been poor, improved, and he developed a thirst for knowledge. To gain acceptance to a local community college, Hershey convinced the dean of admissions to let him attend for one semester; if he did not make good grades, he would voluntarily leave and never bother the man again. That semester he made A’s and B’s, and started on a path that would result in multiple degrees and a career in education. Working at a host of odd jobs to support his studies, Hershey then transferred to Taylor College near Fort Wayne, Indiana, from which he graduated in 1938 with a bachelor’s degree in sociology and a minor in psychology. After graduation, Hershey wanted to marry his college sweetheart, Lucile Kruschwitz, but he needed a job and a place to live. It occurred to him that they could marry and become house parents to students at the Milton Hershey School. Hershey, who was not related to the Milton Hershey family, had visited the school when he was 14 on a vacation with a friend and the friend’s family. At the time, he remembered thinking that had he been a few years younger, he might have qualified to attend the school that accommodates orphans and children from single-parent homes. Hershey hitchhiked to the school, and soon he and his wife were serving as house parents to 23 students. While continuing to work at the Hershey School, Hershey attended classes at the University of Pennsylvania and earned master’s and doctoral degrees in education and counseling. He was also steadily ascending the academic hierarchy at the Hershey School, finally becoming its president in 1950 and remaining at that job until his retirement in 1981. He was also president of the Hershey Trust and the Pennsylvania State Board of Education. Reflecting on his years as an educator, Hershey believed that the greatest thing adults can do for students is to encourage self-esteem and self-confidence. In 1988, Hershey accepted the chairmanship of the Horatio Alger National Scholarship Committee, a position he retained for the rest of his life. Following his death, his wife accepted the Norman Vincent Peale Award on his behalf. 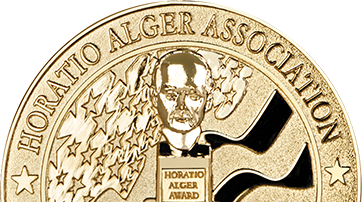 That award is the highest honor given to select members of the Horatio Alger Association.